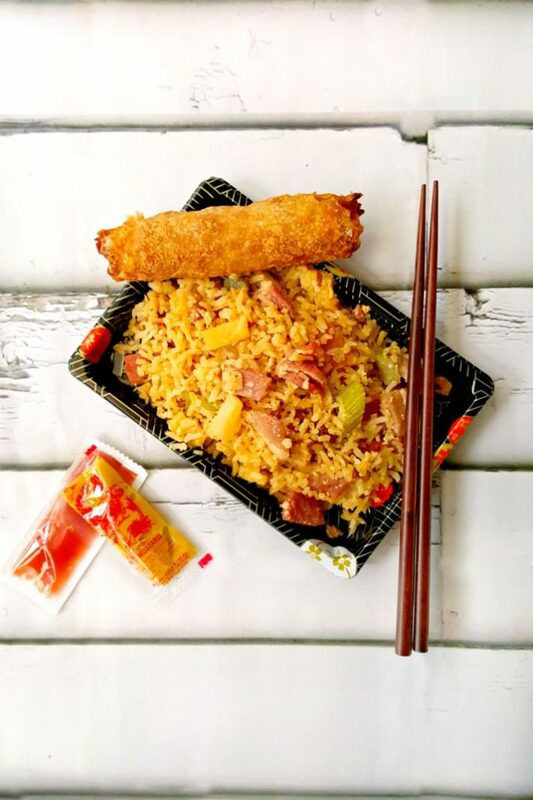 This Hawaiian pizza inspired fake-out food, Hawaiian Fried Rice has lots of flavor and cooks up quick for any night of the week. We have ham at New Year’s. Do you have ham at New Years? Or do you have noodles? Or another turkey? A roast? What?? Just tell me already! Um…so, we had this ham. It was the smallest ham I could find for the two of us. It was a sixteen pounder. Yes. I know. We had a 16 pound turkey, too. What is it with me and the sixteen pound meats? Now, if I could only find sixteen pound angus roast as cheap as the turkey or the ham, I’d be SET! I think we had at least three packages of ham in the freezer including a ham hock for soup. Man. I can’t WAIT to make some soup! It’s so easy to make in the slow cooker. That and some cornbread and it’s the epitome of comfort food for me. Seriously. I remember Dad always had raw onion sliced with his soup. So good. I had some grandiose plans with the ham. Honestly. I was thinking, ham and cheddar enchiladas, some soup, and this fried rice. But, I didn’t want to do just any fried rice. Especially since I had some pineapple in the fridge from Christmas. The steamed pudding I make every year requires pineapple juice. It’s worth it. And it’s cheaper to purchase some tidbits or something in juice than a six pack of pineapple juice. Granted, I’d have pineapple juice for 6 years, but I’m not sure it will last that long. What’s the shelf life of pineapple juice, anyway? So, I had ham and I had pineapple. What’s a blogger to make? Something Hawaiian! I already did pizza. That’s here. Then there’s the kabobs and the deep dish pizza. What’s left? Pasta? Casserole? Fried rice! Bingo!! I’d make some Hawaiian fried rice for dinner. I’m always trying to find some way to make great fake-out food at home. There’s quite a few stir-fry recipes already on my blog. 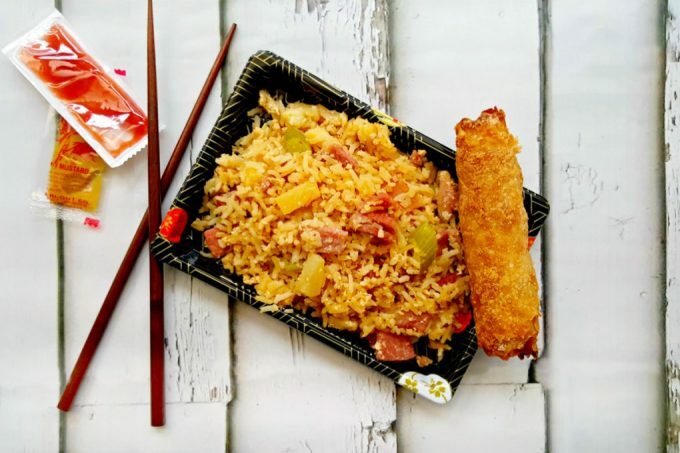 We used to make our own Chinese food feast at home when I was growing up. We had the little yellow Chinese cookbook. No, that’s not it’s official name, but that’s what we called it. It was the go to book for anything and everything Asian that we wanted to make. Egg drop soup? Yup! Sweet and sour soup? Yup! Egg rolls, dumplings, scallion pancakes, kung pao; you name it, it was probably in there and we probably tried to make it at one point or another. It was never a dull moment in the kitchen growing up, that’s for sure. Between the Asian recipes, the Mexican recipes, and the countless Central and Eastern Europe recipes (mainly pierogies and cabbage rolls, but I think there was some borscht in there, too) I definitely have an appreciation of many different types of cuisines. Yes, I know this isn’t really an Asian recipe, but the fried rice method is sort of Asian, isn’t it? I mean, I had Korean friends who always made fried rice for breakfast. I use their method of cooking fried rice with egg in this recipe. Actually, it’s almost the only way I make fried rice any more. I don’t fry the egg separately. I pour the egg over the rice as it’s cooking so that it gets fried with and coats the rice. It makes for a more flavorful rice; at least I think so. No, I didn’t make the egg rolls. I haven’t ventured into that realm yet. Mom still rules that recipe. I’m hesitant to try to make them because I just know they will not compare to the ones that Mom used to make. However, I did make her date filled wontons. They’re delicious and I HIGHLY suggest you make these for dessert after making this fried rice recipe. And stay tuned tomorrow for a completely new Asian fake-out recipe. 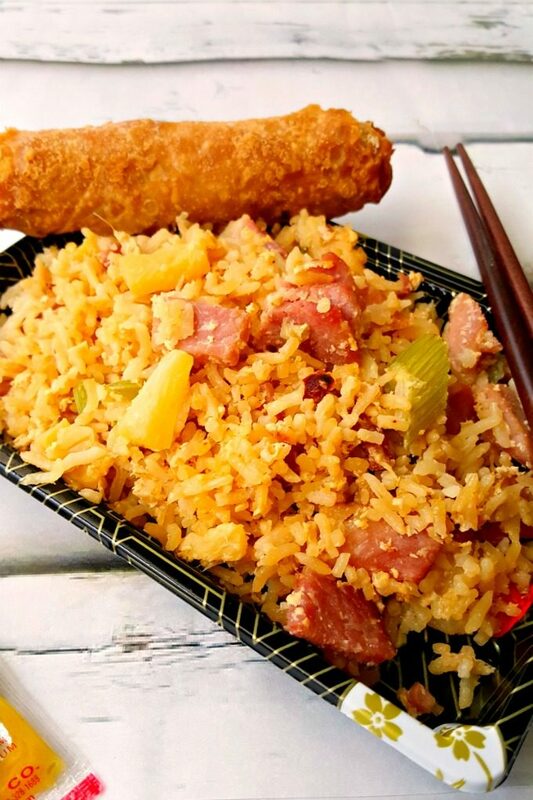 What’s your favorite way to make fried rice? Combine the egg substitute (or eggs) with the soy sauce, sesame seed oil, and crushed red pepper. Set aside. Heat a large skillet coated with cooking spray over high heat. Sauté the onion and celery 1 to 2 minutes. Stir in the ham and sauté until it begins to brown. Add the pineapple and cook until it’s heated through. Add the rice to the pan, stirring until combined. Pour the egg mixture over the rice shaking to make sure the egg is distributed throughout the rice mixture. Allow to cook 1 minute before stirring. Stir frequently until the eggs are cooked. 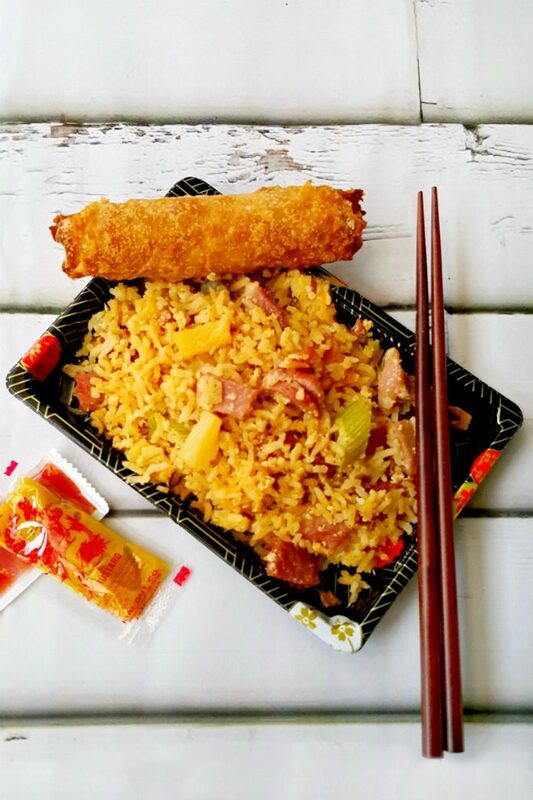 Divide evenly between four plates and serve with your favorite egg rolls. My friend makes something similar to this, but she adds spam to it! It gives it a different flavor than the ham does. It is so good with the spam and I don’t even like spam, but you don’t really notice it at all. Very good!